Grab partners with one of the biggest hotel chains in Pattaya to provide more benefits for Grab users! Ride safe and convenient with Grab; your handy ride-hailing app to your life’s destination. Available now in Bangkok, Pattaya, and other cities in South East Asia. More benefits only with Grab! 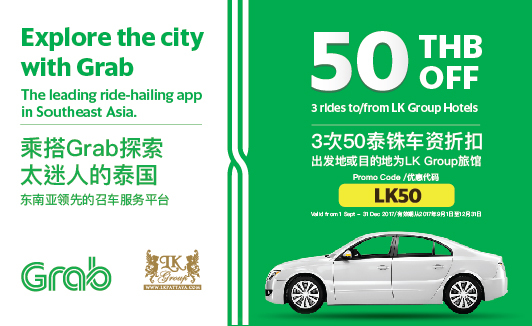 Get 50THB off (3 times / user) GrabCar and GrabTaxi ride from/to any of LK Group Hotels. Apply ‘LK50’ in promo code box before booking. This promotion is applicable for GrabCar and GrabTaxi rides which set drop-off or pick-up point at any of LK Group Hotels. 50THB discount can be used 3 usages per user. Promotion period will be valid and promo code can be used from: 1 September – 31 December 2017 only. Discount cannot be transformed to other forms. Grab reserves its own rights to change the promotion’s T&C at any time without any prior notice.